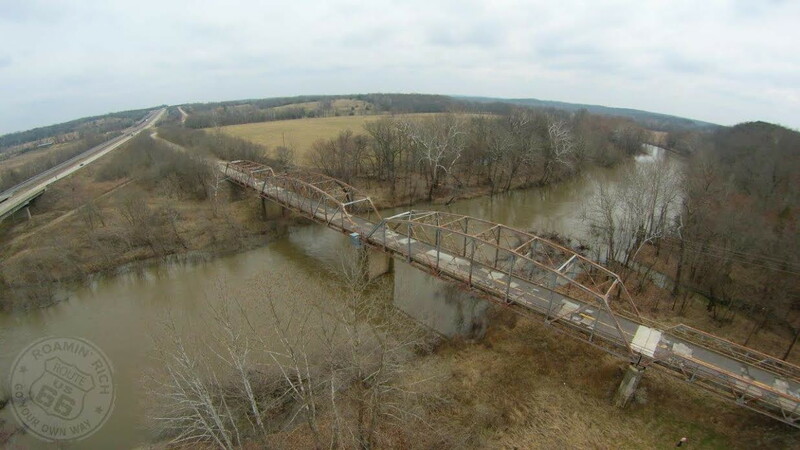 The Gasconade River in Missouri: once populated with dozens of metal truss bridges loaded with history and charm, the river that flows past Wright, LeClare and Gasconade Counties now only has one bridge left. This bridge, built in 1924, used to carry the Mother Highway from Chicago to Los Angeles, Route 66 (officially, US Hwy. 66). 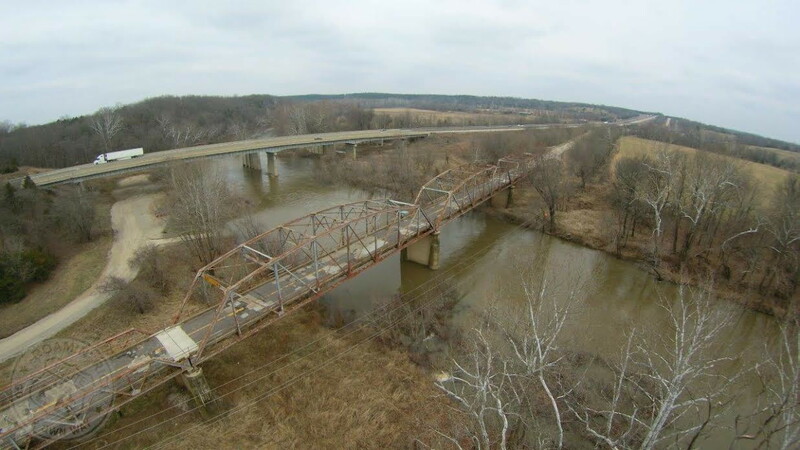 Sadly, this bridge is now the poster boy of how a state, like Missouri, has neglected its bridges, both modern and historic, and does not have the money to even maintain them. Since December 2014, the Missouri Department of Transportation has closed this key crossing near Hazelgreen, despite its historic significance and its role in the development of Route 66. 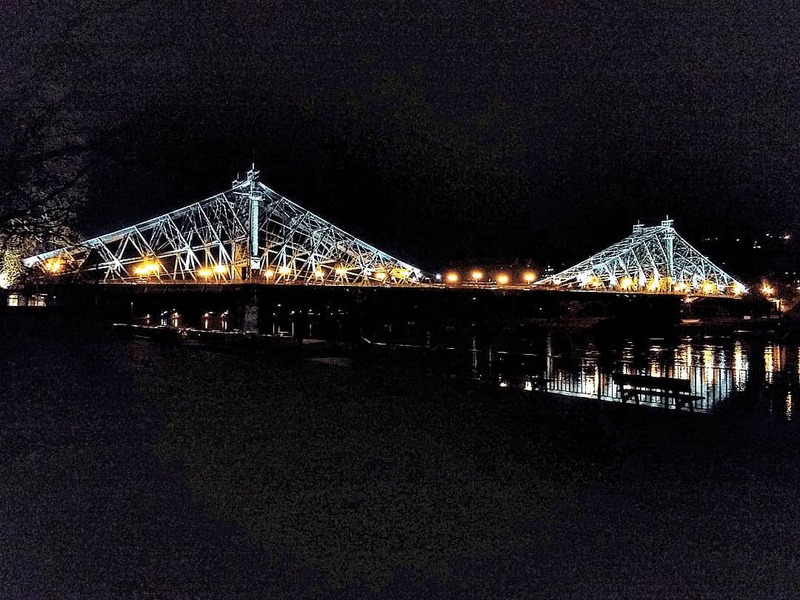 The bridge features three through truss spans and a pony span, going from far to near in the picture above: one Warren through truss, two Parker through trusses, one Warren pony and one beam approach, all totaling 524 feet in length, and all connections are riveted. 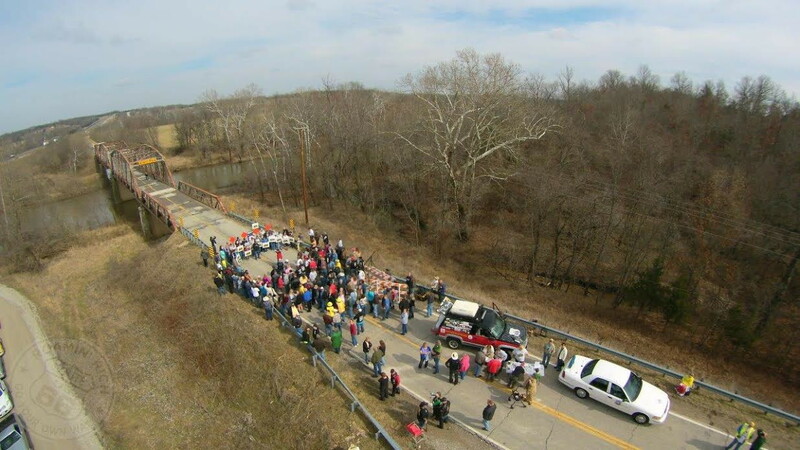 The closure has sparked an outcry among locals, bridge enthusiasts and friends of Route 66 to a point where a rally took place back in March, drawing in as many as 300 attendants. The main objective is to put pressure on the State Legislature to provide funding to repair the deficiencies on the bridge and reopen it to traffic. Given the sparse amount of traffic on the bridge in comparison with the neighboring I-44 Bridge, located only 500 feet away. Information and a video of the event which includes speeches, can be seen by clicking here. 1. How significant is the bridge? The bridge is significant in all facets. It is a major thoroughfare for local traffic. People in the community, farmers, emergency responders all depend on this bridge. There are several farmers in the area that own land on both sides of the river. They are forced to make a 12 mile detour now because of the bridge closure. Before the closure this section of Highway (also historic Route 66) was being utilized as an incident bypass route. So if traffic on I44 shut down, they would divert traffic across this section of road and the Gasconade Bridge. 2. What’s the history behind building the bridge? 3. What’s the current situation on the bridge- are there plans to demolish it? The current situation is indefinite. There is absolutely no money at all set aside for doing anything with this bridge. I seriously don’t think they are going to demolish it even when they do come up with funding. In talking with the chief engineer with MoDot I don’t think they want to mess with repairing it either. A bypass bridge looks like their preferred choice. 4. How do you want to save the bridge- as a pedestrian bridge or by rehabilitation? We would like to save the bridge no matter what happens. We would like to see it put back into service but we are willing to accept any plan that ultimately prevents the destruction of the bridge. 5. How are you approaching the plan as far as fund-raising, etc. are concerned? Right now we are hashing out ideas to raise funds to pay for an independent inspection of the bridge. We have formed an official committee and plan to meet within the next 10 days. We aren’t sure how we are going to raise funds at the moment. 6. How much money is needed to preserve the bridge? Until our independent study is concluded we do not know how much money is needed to restore the bridge. We are guessing between 1.5 – 3 million dollars. 7. When would you like to see the bridge reopened? We would like the bridge to be reopened within the next 24 months. Earlier is better, but we are being realistic. The state has slashed highway budgets drastically. It’s going to take a literal act of Congress to get something done. The irony behind the interview is the fact that MoDOT is trying to cut corners by putting in a replacement bridge at any cost, which would bypass the historic bridge. Yet the envision behind the draconian replace instead of repair is that money is needed to maintain that bridge as well. Without the maintenance, the lifespan of the structure is cut in half. Therefore repairing the bridges only prolongs their lives up up to 50 years, enough time for the state legislature to garner enough funds to either overhaul the original structure or even replace it with a newer structure that has a functional and structural appeal. However, with the state cutting funding, the mentality is to let the bridges fall apart until replacement is the lone option. This is figuratively slitting their wrists and the blood of greenbacks is leaving the body in droves. But if there is one message to give to the state through this rally it is this: This way of thinking has to change, and priorities have to change. That means fixing the bridges and restoring them have more priority than the slash and burn approach, which is costing more money than necessary. And with that, our history slips away into the books, something our society has longed ignored. 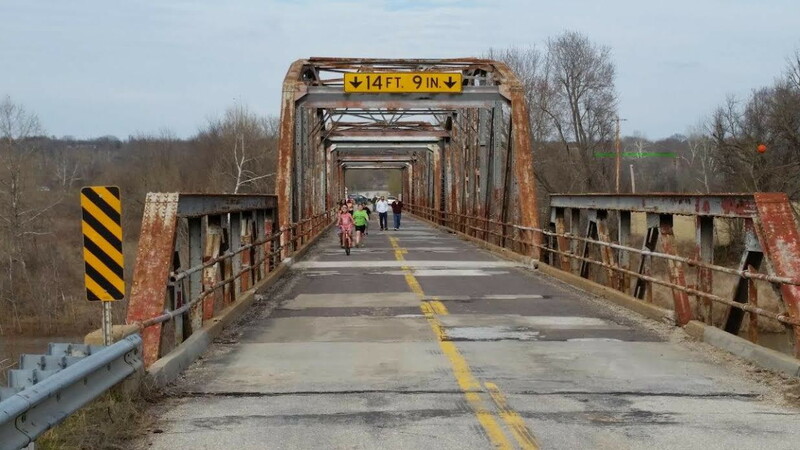 While the fundraising is in its infant stage, you can help preserve the Gasconade River Route 66 Bridge. You can click on the link in the article, where you’ll be in the Route 66 News page. Yet the group has a facebook page, which you can click here and like to join. There you can share your ideas with other members and help in saving the bridge. As mentioned above, bypassing the bridge seems to be the option, yet fixing a bridge that is only used locally would serve in everyone’s best interest. The Chronicles will keep you posted on the latest developments involving the bridge.